Salatin is proud of that label. “I’m a third-generation lunatic,” he boasts while standing in his lush, green central Virginia fields. Brown chickens strut and peck around his feet. “I don’t do anything like average farmers do,” he says. What the 52-year-old farmer does is let his cows feed on grass instead of corn or grain. He moves his cows to new fields daily. Flocks of chickens scratch around open fields, spreading cow droppings, eating flies and larvae, and laying eggs in the Salatin-built eggmobile. Hogs forage in the woods or in a pasture house where they root through cow manure, wood chips and corn. The resulting compost gets spread back over the fields, fertilizing the grass for the cattle. That completes the cycle. “It’s completely counter to current agricultural wisdom,” he says. Current agricultural practices often encourage using technology – petroleum-based fertilizers, hormones and antibiotics – to spur growth and reduce costs as much as possible. Now the “lunatic” is about to come to the big screen in a documentary titled Food, Inc., directed by Robert Kenner. Due to open June 12 in New York, Los Angeles and San Francisco, the documentary takes a critical look at the American food system, contrasting industrial agribusiness with operations like Polyface. The film, which builds on the work of activists like Pollan and Eric Schlosser, author of 2001’s Fast Food Nation, is financed by Participant Media, which also financed An Inconvenient Truth, the Oscar-winning 2006 documentary that made a global warming star of former vice president Al Gore. Like Jefferson, Salatin calls Virginia home. Polyface Farm began in 1961 when Salatin’s parents, William and Lucille, bought the 550-acre property, which Salatin describes as being “anything but idyllic” then, and moved the family there. Salatin took over Polyface in 1982, six years before his father died. Salatin lives in the farm’s 200-year-old white wood-and-brick house. The farm remains a family operation. Salatin’s wife, Teresa, handles bookkeeping; their son, Daniel, runs the day-to-day operations; Daniel’s wife, Sheri, handles marketing. Counting Daniel and Sheri’s three kids and Salatin’s mother, 85, four generations still make the farm home, although each branch of the family has its own house. Eating Polyface’s meat and eggs generally means eating fairly near the farm. Salatin won’t ship his food farther away than a four-hour drive. Customers can come to the farm’s on-site store, open only on Saturdays, or take receipt of deliveries to nearly two dozen towns in Virginia and Maryland. Polyface also serves more than three dozen regional restaurants, caterers, bakeries and small food stores in the region. In addition, Salatin travels around the world giving speeches and presentations on how to copy his success. According to the Polyface website (polyfacefarms.com/), Salatin charges a minimum of $3,500 for speeches and $800 for a two-hour tour of his 550-acre farm. He is also working on his seventh book and fields requests from people around the country who want to learn his techniques. More than 40 people have served year-long apprenticeships with Salatin over the past 20 years. Still more have worked summers on the farm as interns. But he says there was never any pressure to stay in the family business. If he had wanted to do something else, he could have. His sister, Rachel, 22, is pursuing a career in interior design. Daniel manages the animals and the apprentices, such as Grady Phelan, 23, a rancher from Oklahoma. Carrying four Mason jars of raw milk from a neighboring farm, Phelan talks about reading Salatin’s books growing up. “My dad read his books, consequently, I read his books,” Phelan says. The books influenced Phelan’s college education. He decided not to bother learning industrial agricultural methods, choosing zoology instead. Now he studies the Salatin way at Polyface. Peter Burns agrees. In 2004, when he was 16, he spent a year on Polyface farms learning the Salatin way. Five years ago, his 137-acre family farm, Heritage Farms in Oak County, Pa., had 250 birds. Now it is more than 20 times that size. “If it had not been for the Salatins, I’d have no idea how to run a 5,800-bird operation,” Burns says. Critics of this kind of local, all-natural farming have said the food is too expensive and wouldn’t work on a large enough scale to feed a hungry nation. James McWilliams, a professor of agricultural history at the University of Texas-Austin, isn’t convinced that local food is the only way to go. Economies of scale, when it comes to farming and to transportation, are real, he says. Trains and boats, for example, are efficient ways to move food. Trucks, especially over short distances, are not. Halloran disagrees with the critics. For one thing, she says, large-scale industrial agriculture has many costs associated with it that aren’t reflected in the price of food. Castigation of the entire conventional food system “is an easy thing to do, but it overlooks the range of farms and the fact that there are plenty of conventional farms that use very small amounts of artificial pesticides and fungicides and fertilizers,” McWilliams says. As to the argument that Salatin’s methods aren’t scalable and not every farm could operate like Polyface, Halloran says small-scale production can work because cutting the distance between the farm and the consumer will reduce transportation costs, favoring the local farmer. Meanwhile, consumers are starting to place a greater value on the variety and freshness that local farms offer, she says. 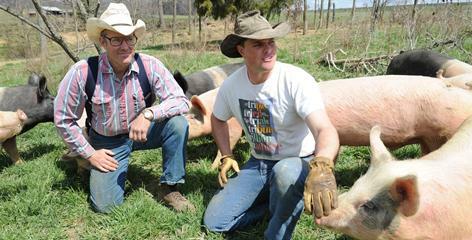 Salatin says his farm feeds more people per acre than other farms, though he concedes it requires more labor than most. To Salatin, his environmental and sustainable approach isn’t just the future, it’s the moral way to farm. He puts down a warm, freshly laid egg and strolls through his herd of cattle.